2 Nomination papers may be obtained from the offices of the Returning Officer, Town Hall, Market Place, Ripley, Derbyshire DE5 3BT during normal office hours stated below. 3 Completed nomination papers must be delivered to the Returning Officer at the Main Reception, at the Town Hall, Market Place, Ripley, Derbyshire DE5 3BT on any date after the date of this notice, but no later than 4pm on Wednesday 3 April 2019. Office opening hours are Monday, Tuesday, Thursday and Friday 9am – 4.30pm and on Wednesdays 10am – 4.30pm (excluding Bank Holidays). 4 If an election is contested the poll will take place on THURSDAY 2 MAY 2019. 5 New applications to register to vote must reach the Electoral Registration Officer by midnight on Friday 12 April 2019. 6 New applications, amendments, re-directions or cancellations of postal votes must reach the Electoral Registration Officer at the Town Hall, Market Place, Ripley, Derbyshire DE5 3BT by 5pm on Monday 15 April 2019. 7 New applications to vote by proxy at this election must reach the Electoral Registration Officer at the Town Hall, Market Place, Ripley, Derbyshire DE5 3BT by 5pm on Wednesday 24 April 2019. 8 Applications to vote by emergency proxy at this election on the grounds of physical incapacity or for work/service reasons, must reach the Electoral Registration Officer at the Town Hall, Market Place, Ripley, Derbyshire DE5 3BT by 5pm on 2 May 2019. The physical incapacity must have occurred after 5pm on 24 April 2019. To apply on the grounds of work/service, the person must have become aware that they cannot go to the polling station in person after 5pm on 24 April 2019. Somercotes Choral Society, after years of absence is to perform in Somercotes in April 2019. 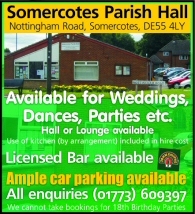 Their next concert will be at Somercotes Village Hall on Saturday 27th April. Jen Adams, the Choral Society’s Chairwoman, says that the choir was formed in 1953 by the late Wilfred Clarke. Jen says details of the concert will be announced later, but it will be a very varied programme. Wilfred Clarke’s son Jeff is still a member of the society. He joined in the early 1960’s and recalls that there were 60 members including 20 men .Today there are only six men and more are needed! The Choral Society’s Musical Director is Neil Farley of Belper and the accompanist is John Hobbs of Risley. The choir practices at Swanwick School and Sports College, Hayes Lane, Swanwick every Tuesday evening. They welcome new members, particularly men. We would like to include any interesting stories or photographs you have about your community or any local events, which you would like advertising. If you have anything that you would like to share with other readers please contact Catherine on 01773 603810 or call into the Parish Council Office at the Village Hall between 10:30 am to 2:30 pm Tuesday to Friday. If you find a needle, DO NOT PICK IT UP. Please call Amber Valley Borough Council’s needle hotline 0800 092 51 31 free anytime day or night. Their aim is to collect a needle within two hours of any reported incident. Since the Borough Council decided to stop providing Poop Scoop Bags, the Parish Council has been providing them completely free of charge. So many people have called into the office for these bags that we have been impressed that so many people in the community are concerned about keeping the parish free from dog mess. There is, however, still a problem with dog fouling and it is hoped that those people who have not bothered in the past to clear up after their dogs will now do so using the free poop scoop bags. These are available from your Parish Wardens, Colin and Les, or you can call into the Parish Hall Office between 10.30 am and 2.30 pm Tuesday to Friday, and ask for a supply. Stop N Shop on Nottingham Road also have a supply of bags. The four ponds are balancing ponds for the drainage of the surrounding land. Moorhens, Coots and Mallards can be seen on the ponds and regularly breed. Mayfly, Damselfly and Dragonflies are seen throughout the summer and 25 species of water beetle have been recorded on the site. If you are lucky you may see Kingfishers flying low over the water and grass snakes during the summer. Pennytown Ponds was once part of a large parkland known as Cotes Park as early as the 14th century. At the beginning of the 19th century the park was sold off in smaller parcels of land. Cotes park hall once stood in the centre of the park but this disappeared with the development of the industrial estate. A reminder of its existence is the stone outbuilding at the top of the bridlepath. The ponds became isolated and forgotten as the industrial estate was developed during the 1970s, however, the site was designated as a County Wildlife site in the 1980s. Investment in the 1990s and the works of the Pennytown Ponds group and Groundwork has given the area a new lease of life, with the site becoming a Local Nature Reserve in 2002.